Located on East Side Drive (Rte 28A) – Raised beach, covered picnic area, swimming, seasonal lifeguard, benches, seasonal restrooms. Located on Rte 11N at Riley Rd in West Alton – Access to Lake Winnipesaukee for swimming; deck, limited parking. 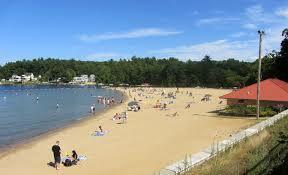 Located on Roberts Cove Rd (off Rte 28N) – Access to Lake Winnipesaukee for swimming; sand beach. The Meredith Parks and Recreation Department is in charge of maintenance. Located on Lake Winnipesaukee – Leavitt Park Rd. off Route 25. Beach, picnic area, barbeque grills, playground area, and public canoe/kayak launch. Public restroom and showers available as soon as weather allows. The Meredith Parks and Recreation Department is in charge of maintenance. Located on Lake Waukewan – Waukewan St. Free Public boat launch within walking distance. Public restroom and showers available as soon as weather allow. Lakeside Avenue Laconia – Located at the corner of Endicott Street and Lakeside Avenue and it is the focal point of the tourist area of Weirs Beach. This area has a small limited playground and picnic facility, 450 feet of life-guarded beach frontage on Lake Winnipesaukee and a changing-room facility with restrooms. 182 Bond Beach Road – his area has 1000 feet of frontage on Lake Opechee, including a life-guarded beach of approximately 200 feet. There are also picnic facilities changing rooms, restrooms and fishing. Most of this parcel is undeveloped and is used for nature walks and cross-country skiing. Maintained by the Town of Moultonborough, Long Island Beach is located just over the bridge to Long Island (the largest island in Lake Winnipesaukee). Lifeguard coverage of Long Island Beach runs from mid-June through late August. Also maintained by the Town of Moultonborough, States Landing Beach is located at the end of States Landing Road off Route 109. Both Long Island Beach and States Landing Beach are open to Moultonborough residents or taxpayers who have beach stickers, available at the Moultonborough Town Hall for just $20 for two years. States Landing Beach is not guarded. The Town of Tuftonboro maintains two public beaches. Mirror Lake Beach is a sandy beach located on Mirror Lake and has a boat and canoe launching area. Melvin Village Town Pier Beach is located on Lake Winnipesaukee in Melvin Village, Tuftonboro. Located on the shores of Lake Wentworth, Albee Beach provide lifeguards from mid-June through the end of August. Summer amenities include two charcoal grills, picnic tables, and a community sailing program. Big bonus: The Cotton Valley Trail runs along Albee Beach, making it possible for residents to bring bikes and cycle to downtown Wolfeboro and back. Year-round the beach is open sunrise to sunset. The parking lot closes after the first snow and reopens when the snow melts in the spring. Located at 60 Albee Beach Road in Wolfeboro. Located on the grounds of Brewster Academy, Brewster Beach is operated by the Wolfeboro Department of Parks and Recreation. Lifeguards are on duty mid-June through the end of August. Brewster Beach is home to the Wolfeboro swim team and swimming lesson program. The beach is open sunrise to sunset year round. A plowed parking lot allows for winter activities like ice fishing. Located off Clark Road in Wolfeboro. Carry Beach is shallow, making it ideal for families with young children. Lifeguards are on duty mid-June through the end of August. Carry Beach hosts the annual Granite Man Triathlon on the third Saturday in August. The beach is open sunrise to sunset year round. The parking lot is plowed and provides public access to the beach during the winter months. Located at 201 Forest Road in Wolfeboro.